*Please note that we may not always respond immediately to puppy applications unless we have a planned breeding posted. Please feel free to check back if you have not heard from us by sending us an email at munaut@gmail.com. We also welcome phone calls! 18 month old white male standard available to approved home mid Dec 2018. We do not have any puppies at this time but are planning a breeding early 2019. Please fill out our online application to be considered and received updates about the litter. 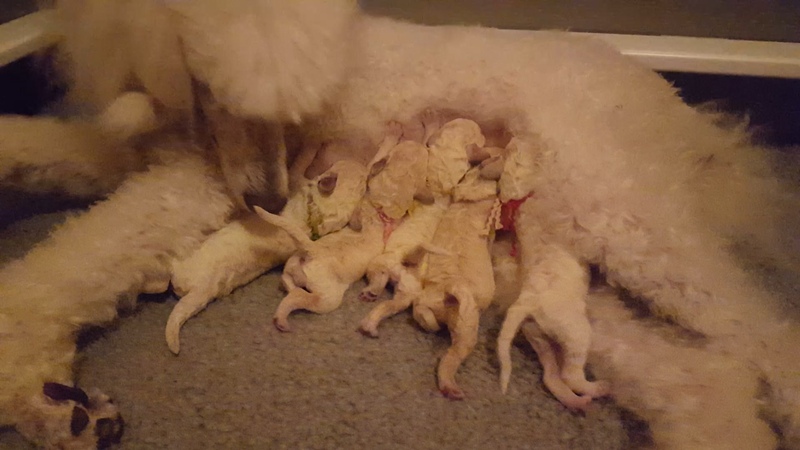 Puppies are here! Our co-bred litter with Desert Reef has arrived born on March 20th! Our “Arora” Munaut Desert Reef Spellbound So Divine, has been bred to “Baron” CH Samir Da Maya. 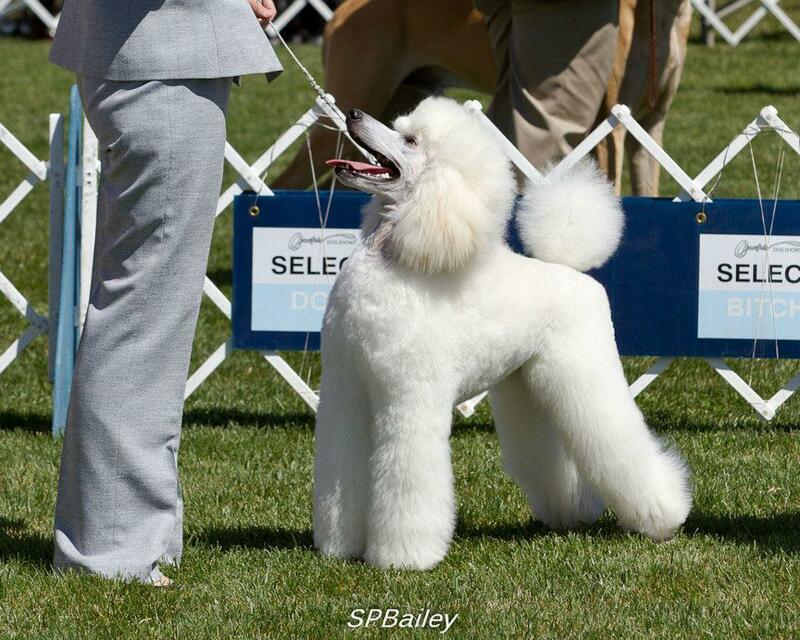 We are grateful to Fred & Sue Horn of Elektra Poodles for allowing their wonderful dog, Baron, to be the sire of this anticipated litter. To apply please fill out our online puppy application by clicking on the link at the top of the page or give us a call! Arora had 2 white males, 1 white female, 2 dark males, and 2 dark females! We won’t know whether the darks are blues or blacks for another couple of weeks. So much has happened since our first week update! They are on their 4th week now! In a nutshell some of their milestones have been having their little eyes open to the big world about 2 weeks ago. They have been able to steadily walk and play around and are doing excellent at using their potty pads! Their teeth are coming in and they have been started on some solids last week to help mommy Arora out! Their sharp teeth hurt and we have found her starting to give us the signs that weaning time has commenced! If course they wont be fully weaned for some time but they are off to a great start. Lapping is like second nature to them now and they are making less and less of a big mess and more in their tummies. Next week they will likely experience their first time outside and we hope to capture some of that fun. The kids are in love especially our 2 yr old. It is so good for the puppies to receive a lot of attention from the kids which prepares them for all sorts of things in life to come. We also look forward to shaving their faces over the next few days! Okay well that wraps things up until our next update! Our little angels are all grown up since our last update! Here are some pictures of their precious faces! We were very pleased with their temperament tests last week and this week they were evaluated for conformation. They will be starting to go to their new homes next week! We have one white female and one dark male available to approved homes. If interested please contact Erica directly by phone (801)389-2559 and you may want to fill out our online application above. ‘Aspen’ CH Desert Reef Stand By Me has been bred to GCH Penndragon Masaniello ‘Micah’ and his son, ‘Owen’ GCH Penndragon Owain! Puppies expected first week of July here in Southern UT! Aspen has been confirmed pregnant! Contact us to be placed on our list if you are interested in a puppy from this litter. We would appreciate it if you would also please download, fill out, and return our puppy application via email with your inquiry. You may also request it to be sent to you via email. Thank you for your interest in a Munaut Poodle! * UPDATE * Today (6/16) was the first day I felt for puppy movement and as I placed my hand on her I immediately felt two little kicks! I proceeded to feel in another area and my hand was greeted by one big kick! All is going well and Aspen is scheduled for an xray on the 29th to give us a head count! We will be setting up the whelping box in the puppy room this coming week! Aspen is a fun and lively girl that enjoys her toys and loves to please. She is excellent with my kids, easy to live with, and enjoys being part of the action around here when things pick up. Her silly antics make her a neighborhood favorite for sure. More of Aspen can be seen on our Champions page. Micah is a tall, impressive, and elegant dog that has a very calm and pleasing temperament. He is also quite the love bug. I experienced this first hand as I had a chance to spend several days with him last fall. I can now attest to all of the great things I’ve heard about him. His son, Owen, is nothing short of his father with a lot to offer our breed. The apple does not fall far from the tree. Needless to say we are very excited about this breeding. 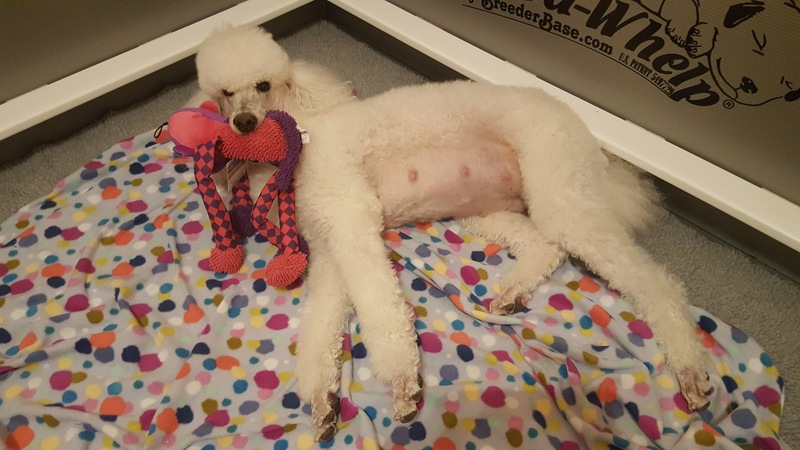 We are expecting very nice poodle puppies soon! Aspen is being an excellent mother and loving her sweet babies. 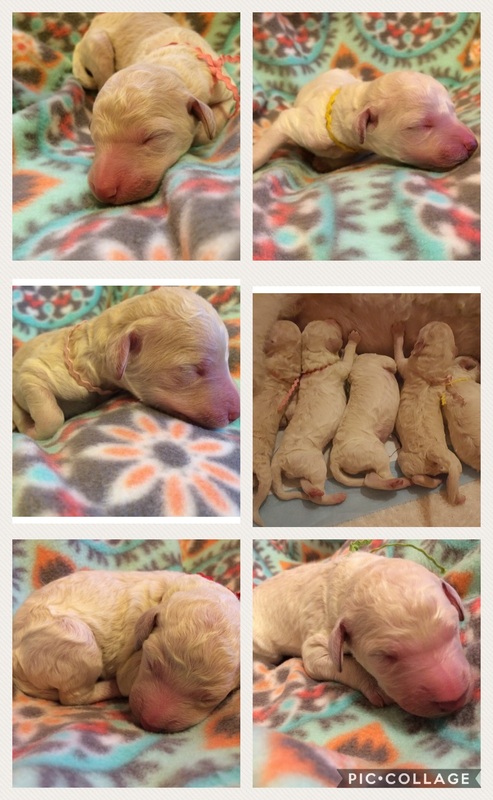 They are so strong and several were cruising around the whelping box from day one! They have been eating well and gaining weight all along the way. The children have sure enjoyed being able to watch them and their funny little movements and sounds. We are performing daily early neurological stimulation exercises and they are already being exposed to a variety of new things each day. 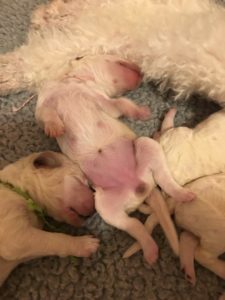 These little pups are sure becoming busy bodies as they are starting to open their eyes and explore their new world. We have started adding a potty pad which some have been using already. They have been trying some new floor textures and toys. Eve just loves squeaking their toys by them in hopes they will come play with them. A few have been spotted having little dreams and heard making little yelps in their sleep. Yellow girl gave me a good little grrr as I rubbed her sides a little rough! They are so fun to watch as they stumble around trying to keep their balance. When mom enters they are quick to find her and load up their tummies. All is well and that wraps up week two for these little precious angels. What a busy and fun week it has been. There is nothing holding these little ones back as their eyes all opened at the start of the week (some a bit sooner) and they can see, hear and track down mom much faster! They are interacting with each other and the world around them more and more each day. We still have two days to go until they officially hit a full 3 weeks old but here is a video of them taken last night as they romped around. Poor momma Aspen can be heard whining in the background as she wants to run to their rescue and check on them every time she hears any kind of a yelp, growl, or squeek. She is an excellent mother and we are so proud. Enjoy the puppy fix for the day! As we hit the middle of this week the puppies will start to learn to lap up food. It is the early phases of weaning time. By the end of the week they will have started to eat goat’s milk formula and then gradually we will be mixing in raw meat. We will be sure to take some pictures of the first time as it is quite the event. They wear more then they tend to eat. Kids are having a blast every chance they can get with them. We have invited a number of visitors already but will step that up a bit at the 4 week peak mark. We put a mini tennis ball in there for them and a few thought that was pretty interesting. They continue to receive new toys and smells daily. At the end of the week we will be shaving faces! Stay tuned for those pics! Three weeks old and 1 day! Where do we start with how much has gone on this week? So may new things for these little ones. The pups have been eating a variety of new raw meat protein sources. They are teething like crazy and learning to rip meat from bones. We have had a large amount of new visitors over to see them and they all seem to enjoy being held and loved up by all. Our kids are of course their biggest fans as they continue to jump in the puppy pen daily for a good time. We had some company come visit as well this week so the new sights and sounds in the home were interesting to them. We have been bringing them out to explore one by one in our living room to slowly introduce them to being in a new environment. Some have taken a real good notice of the TV especially light pink girl that took a long pause to watch it! They have all been very good about being away from their “home” with no complaints! In the next day or so we will allow the puppies to venture outside for the first time! It will be a very exciting experience for them. They will also receive their first bit of water. We will also be transitioning them to a larger more stationary pen in the middle of our living room soon! Lots happening this week! Enjoy some of our captured adventures! 5.5 weeks old and time for bed! At the beginning of the week the puppies spent their last time in the whelping box and weaning pen. They were transitioned into the open dining room with all of us for more room and an easy access to the outside. Boy how they’ve grown! These little pups have sure grown some long legs and are learning how to use them to race around the yard! They have have been so fun to watch. They are of course learning too that there are many things outside that you do not eat. Mamma Aspen has been doing a fine job of policing their activities. They learn from her when its time to settle down. When we water the plants outside they are usually out with us enjoying the little sprinkles of water on their faces. They are now masters of going up and down the two steps on our patio. They are just about 100% weaned from mom. They have eaten a diet full of a variety of protein sources including, turkey, chicken, beef, pork, bison, venison, lamb and duck. I will also add a picture of the raw diet they have been on. They have also had chicken wings, drums and On Monday we incorporated some of the early phases of clicker training called “loading the clicker” to help form the understanding that something is expected of them. We will continue to do small sessions of this throughout their remaining time with us. We also crumpled up a ball of paper to throw. They loved this and ran after it bringing it back to us often. There are some nice little retrievers here! At the end of this week we will be giving them their first bath along with another face feet and tail shave. They will also have their first car ride. Crate training will begin this week too with small sessions in their crates with some yummy chews to associate positive things while inside. Here are some pics of them this week and I will see about uploading a video too. As you know we are big supporters of raw feeding. We believe that there is absolutely nothing better than the natural species appropriate diet of raw meats, organs, bones and small amounts of varies vegetation. Our pups are primarily raised on raw foods but are introduced to a small amount of grain free high quality kibble around 7 weeks old. We highly suggest that you continue to feed your new puppy a raw or sometimes called BARF diet. 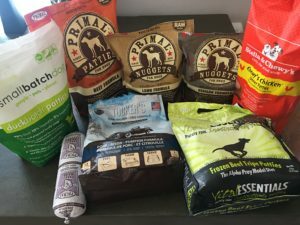 Many natural pet health food stores or specialty stores are carrying raw food now either frozen or freeze dried. Here is a picture of the variety of diet these pups are currently on. Some of the primary brands we use are Primal, Stella & Chewy’s, Tuckers, and Small Batch. We use a variety of protien sources but mainly feed chicken, beef, pork, and duck. We only give very limited amounts of lamb, turkey, venison, and rabbit for various reasons. We also give them raw chicken wings, chicken necks and turkey necks, chicken hearts and liver. They also enjoy frozen green tripe as supplemental feeding. Some of these items can also be ordered online from places like Chew.com etc. We highly suggest searching for local stores that supply raw food for your poodle. Raw fed dogs have higher chances of living much healthier enriched lives overall. 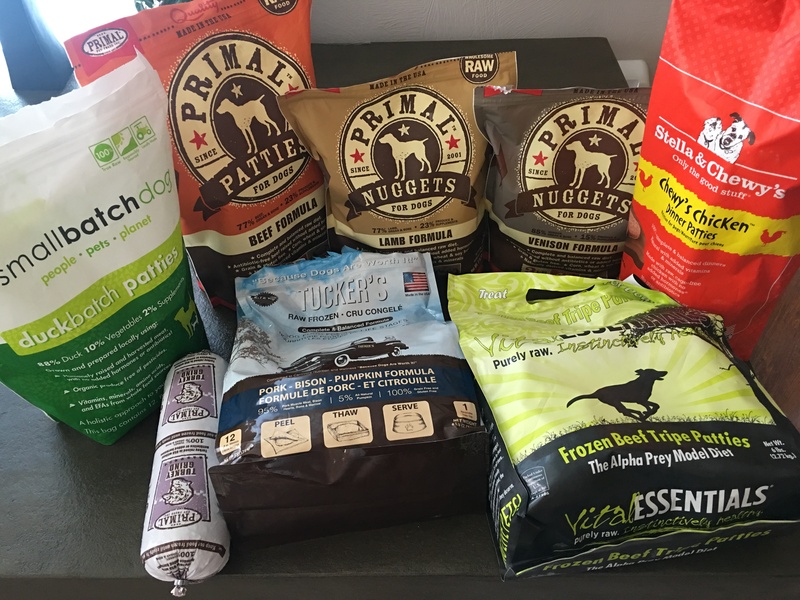 We introduce minimal amounts of kibble as mentioned above solely for convenience for their owners that choose not to feed raw or may want to do a combination of both. Keep in mind that raw and kibble are never to be fed together at the same time. Kibble requires a totally different ph level in the gut to digest and also travels at a different rate of digestion. You do not want to allow bacteria to sit in there longer then it is naturally supposed to or cause a blockage so do not ever feed the two together. 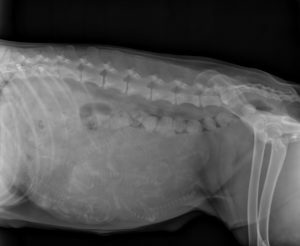 We typically will feed raw in the am, two raw meals in the afternoon and then kibble at night to help hold them over until the AM. We do not always feed kibble but when we do this is how we usually do it. The puppies were fed kibble kibble in the AM during the below video for the first time only because if I had an issue with any of it I would be able to get them to a vet during regular business hours. The below photo is of the kibble we introduce. 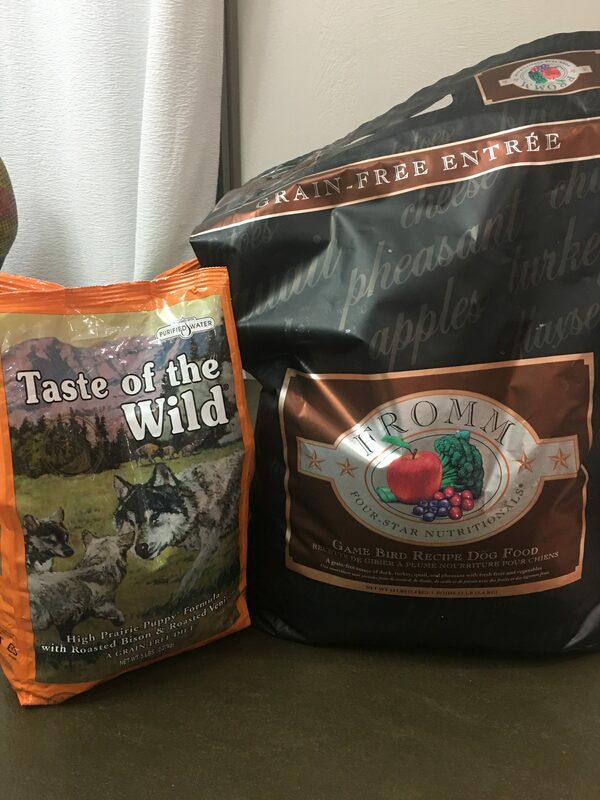 Fromm Game Bird and Taste of the Wild Puppy are the two we mix. I use Taste of The Wild because it is easy for most to find locally. Fromm is a bit harder. Taste of the wild is an okay food but should really not be fed by itself. As long as they are getting raw food during the day it is fine to feed. Fromm is a great food if you can find it. We also always wet the kibble by soaking it in water. We sometimes also add a tablespoon of a high quality grain free canned food. Evangers is one of our favorite brands. At the start of this week on day 50 the puppies were temperament tested. We were very pleased to gain a second opinion and find out a little more about these special individuals 🙂 The puppies have started sleeping in the crate. We still have a few whiners but they are beginning to feel more comfortable especially with lots of yummy chews inside. They are on average sleeping between 5-6 hours before they need to be let outside. We suggest that those that are expecting to bring a puppy home that you prepare now if you haven’t already for an enclosed area that consists of a space for play lined with a small rug or blankets that wont slip around too much, a potty area with potty pads, as well as a small crate or a large one with a divider so as to not allow too much room in the kennel while they are small. They should be able to minimally stand up and turn around. We also suggest a few healthy chews on hand for them to enjoy while in their crate at night. During the day we leave the crate door open for them to come and go as they please, Also, fresh distilled water should be available to them at all times in a clean stainless steel bowl (never plastic). We us a small pail that we attach the handle to the side of the exercise pen with two lobster clasps to keep it in place. I have a lot of people ask about how we set up the potty for them..as for the potty area we buy twin mattress toppers or smaller ones and tape the corners to the floor. We then place our pads on top of that and the outside edges under the xpen to keep from sliding. We position the potty area in the general direction of the exit to the outside but enough away from where they exit the gate of the xpen. If you can place your confined area close to the door to be let out I promise your life will be much easier and convenient for letting pup out regularly. We only need to wash the topper every few days or so with 5 puppies 🙂 It helps to protect your floor. The puppies will learn to fully eliminate outside eventually and the idea is that you should always take them outside immediately when they awake and 10-15 min after eating. As they slowly gain the trust in the house you can eventually take away their enclosure leaving only the pads if you wish. Continue to be consistent and you will be on your way to a fully house trained pup in a short amount of time. I usually find myself completely removing the topper and pads around 14 weeks old. That tends to be a little quick for me because the pups were raised here and never had to go through a transition phase. Always treat the puppy like it has never learned anything about housebreaking from the get-go. It is a new home completely unknown to them so be prepare to be very consisted to establish a routine right off the bat. I also sometimes just use the mattress topper with no pads. It is basically left near the door and provides a place if the puppy “has” to elimiate rather then learning to go just anywhere. You can also buy potty attractant sprays and give it a slight mist to encourage where elimination should happen. Most are fully trained/trusted by 4-6 months old on average. Keep in mind that it is common for dogs to take steps backwards but you should continue to be consistent and always revert to the crate again if you chose to let them sleep outside of it at night. Crate training is the easiest best thing for them in our opinion while they are at least young and learning. I had one that at almost a year old for whatever reason started having accidents in the house. She had been trusted since she was 4 months old and had not been sleeping in a closed door crate since then. Well, after that she went back into a crate for a week and then she never did it again! The crate is your dogs den and should be a happy comfortable safe place for them where they can go to. We never suggest giving new puppies full reign of the home. You are asking for more work for yourself if you start off this way. Know ahead of time where everything will be set up and have it ready before puppy comes home. I am happy to help walk anyone through our process to help set up the puppy for the quickest chances of success. As a side note today 8-20-17 was the first time the pups learned on their own to use the dog door. Now the reason this is impressive is because our dog door leads to a long narrow ramp that goes down to the ground outside. The puppies all climbed up and down it today! The boy did it first and they were soon to follow! I walked into the kitchen to find him inside drinking the adults water when he was supposed to playing outside! Smart cookies these pups are and to have gone up a ramp and through a double flap dog door on their own was very impressive! We will be taking our first car ride tomorrow and some light leash training will commence over the next few days. Please bear with me on a lack of photos and videos to upload as I will be very busy working with these pups. I will try to get some posted though if I have a chance to. Okay bye for now! 7.5 weeks Save the baby! 1 week left to go! She is such a beautiful mother. Not much more room in there! We are starting to spend more time in the whelping box. Aspen dug through the puppy toy box and found a new favorite to bring with her! Aspen had her xray! We think we see at least 5 puppies although there looks to be a slight possibility of six judging from what appears to be tiny leg bones over to the far right. In an case we are excited for these littles to arrive soon! Now we play the waiting game! Are you searching for a new puppy? We are planning to have puppies this summer of 2017. 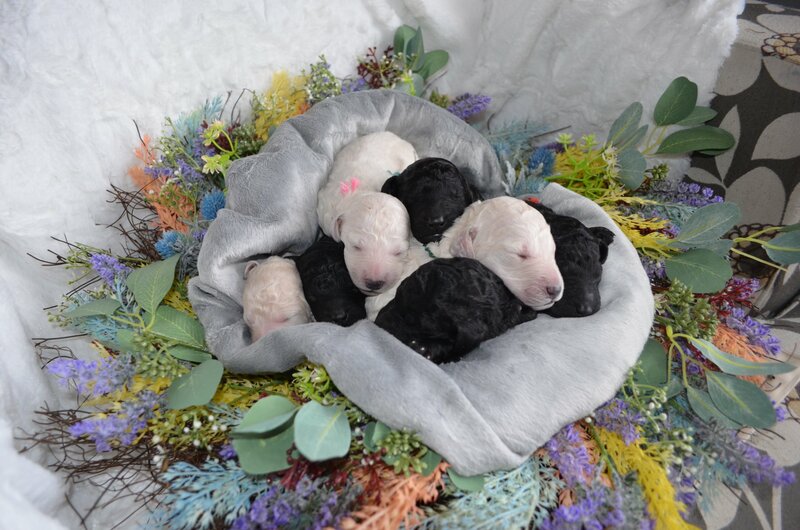 If you are interested in a standard poodle puppy please give me a call or fill out our puppy application and we will be in touch! & an older white male puppy available to a guardian home. Male must be kept intact for breeder. If we have any adults available we might post it above. We also might know of some available. You are welcome to contact us if you are searching for an adult. A guardian home is a person or family that we sometimes place standard poodle puppies or adults with to keep the dog intact for future breeding purposes. 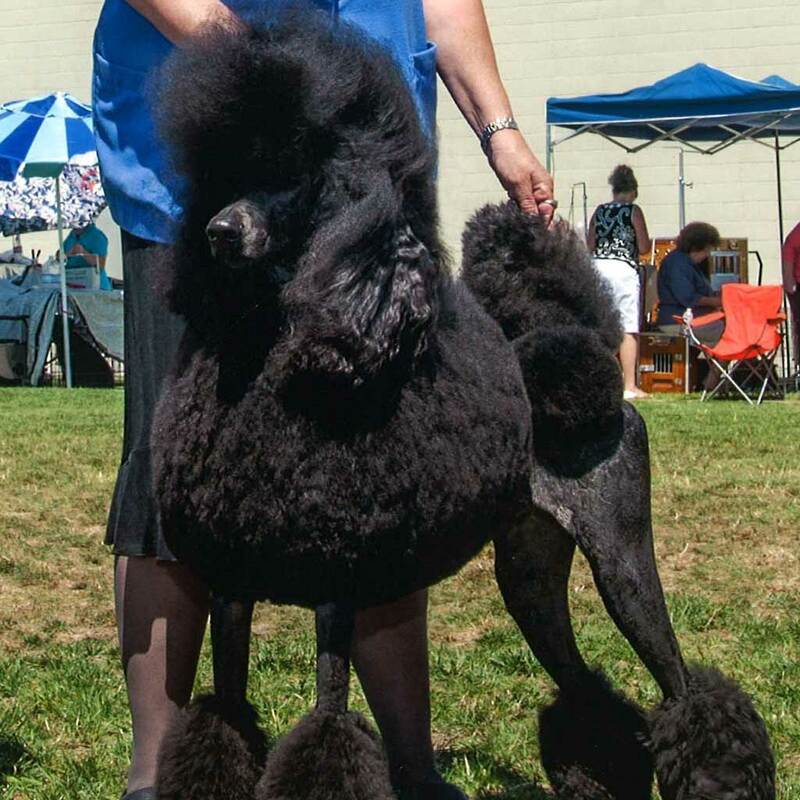 The poodle is co-owned by both the guardian and the breeder. If you are interested in this type of arrangement please call or email me to discuss options. 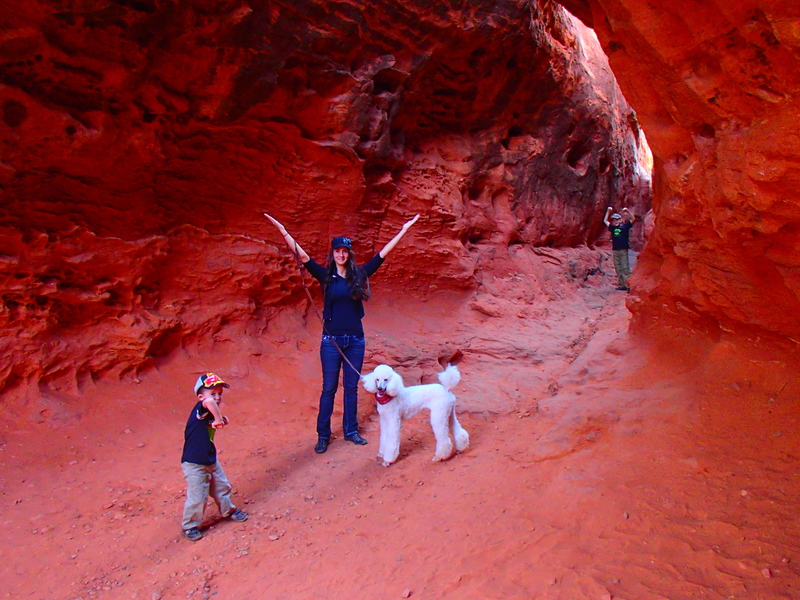 We are a small hobby breeder located in Santa Clara, UT which borders St. George, Utah. 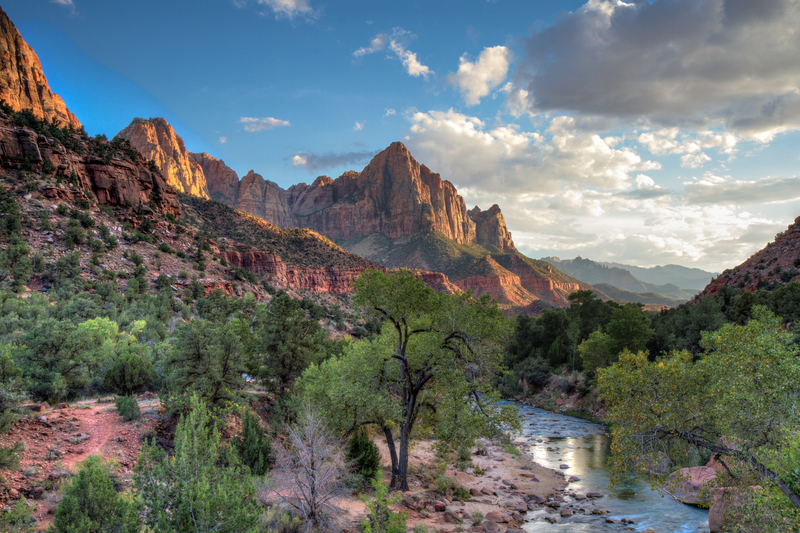 We are a 2 hour drive north of Las Vegas, NV and about a 4 hour drive south from Salt Lake City, UT. Our Kennel will occasionally have poodle puppies for sale available only to good discerning homes. Every puppy is raised in our home underfoot among our family of 5. We have three children under the age of 10 and we are proud to report that our fur babies are very genuinely social with children throughout their lives because of their environment early on. We believe in a high quality diet and minimal vaccinations following Dr. Jean Dodds Vaccination protocol. Rearing our pups as naturally as possible is very important to us for the health and well being of our babies. We want to give our puppies the best forever homes. The opportunity to get to know you and the type of home you can offer them means a lot to us. Please take the time to call, drop us an email or fill out and return our puppy application. We consider every new owner of one of our puppies a part of our extended family and would like to be involved with you and your poodle. It is important if we are to keep track of the quality of our breeding program. We will post details about any future breedings and other information here on our puppies page. 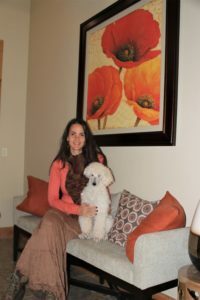 We are a small scale standard poodle breeder and do not breed often. When we do it is to produce a new puppy to carry forward with. We consider every puppy that we breed a part of our family and only sell to approved homes. Because we want our extended family members to be happy, well cared for and matched up with the best possible family, we ask that you either fill out our online puppy application or that you download and fill out our puppy application. Once completed please mail it back to us. This is the first step and provides a great resource for us in understanding your desires and needs so that we can help match you with the right puppy. It also helps us to know which areas we can help you in. We perform temperament testing at 7 weeks and have been very successful using the Volhard Puppy Aptitude Method combined with our own observations. If you choose to download the puppy application please email it back to us at munaut@gmail.com. We are excited to learn more about you and your family and to have you experience the same joy that Standard Poodles bring to our lives. Should you accept the terms of our contract we ask that you please leave a refundable deposit once the puppies are born if there looks to be a male or female of the correct color you desire. Temperament testing is professionally performed at around 7 weeks old. After testing is completed if there looks to be a puppy that does not meet your needs then your deposit is returned. 3. Picking up your new Puppy! We prefer that you come to visit us at our home so that we can have the opportunity to meet you. We like for you to see how we raise our puppies, and for you to have a chance to visit with our dogs. It is well worth it we promise! 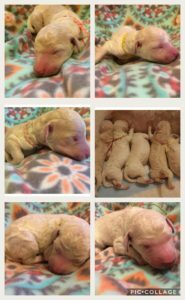 We have shipped our poodle puppies in the past or arranged for a transport when it is absolutely necessary but this is not our preference and suggest against it due to circumstances out of our control with airlines etc. Please consider coming to visit us in southern UT we would love to have you meet your new best friend in person! Why Should Your Family Get A Standard Poodle? The Standard Poodle is a wonderful dog breed. 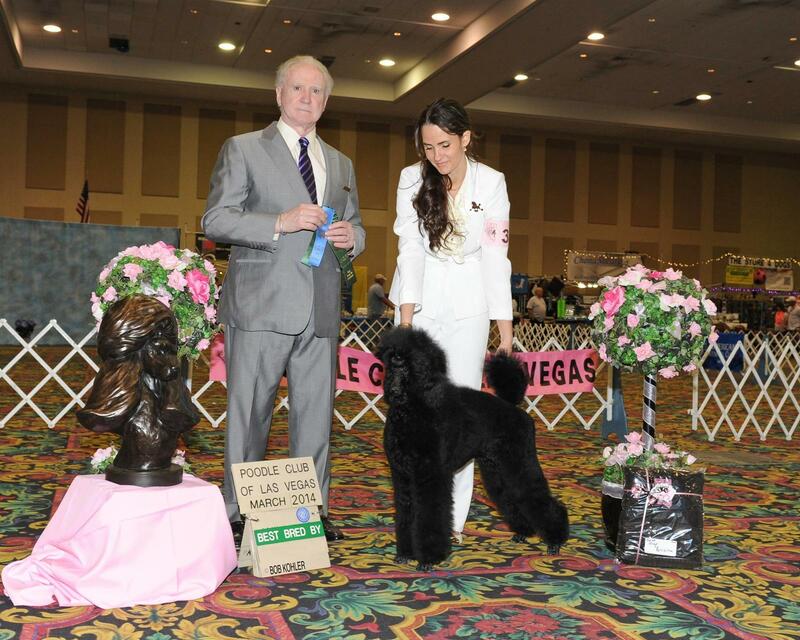 At the Westminster Dog Show, the standard poodle was announced as the ultimate man’s dog. They can swim, work, and be a great companion. They have excelled in all manner of canine sports and activities. 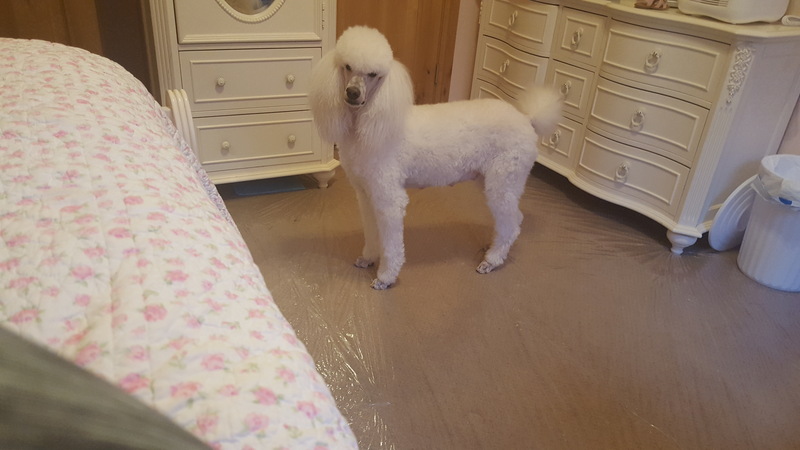 An exceptionally high level of intelligence is what you can expect from a standard poodle as well as many other capabilities that people love. The best qualities are that they can be active when needed, willing to please, loyal, non-shedding, and as I mentioned above are very smart according to the AKC standard poodle page. They are excellent family dogs and are great with children. If you have never owned one you may not know much about them. Often, they are highly misunderstood. Sometimes people tend to overlook their amazing qualities because of their “oddly” trimmed coat. 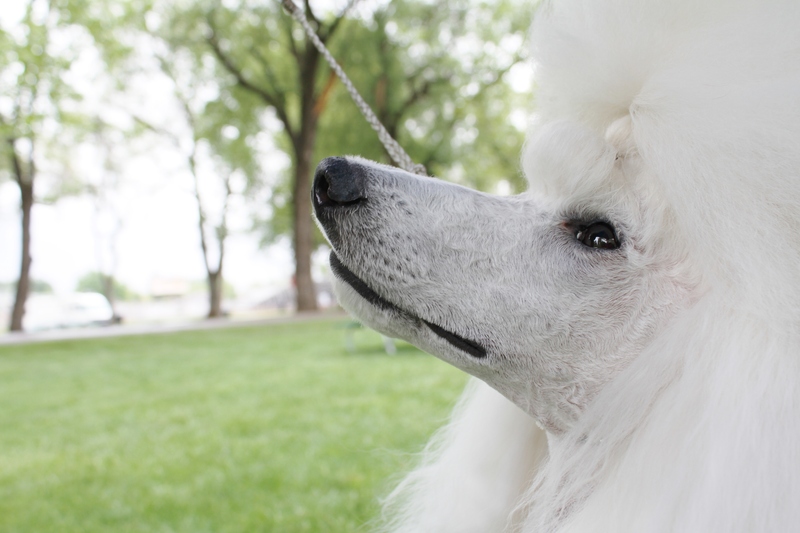 Poodles have roots as water fowl retrievers in cold icy waters. They are shown in AKC in a trim that resembles the trim they were given years ago for mobility and protection of their joints and vital organs while working in the water. A poodle in a show trim may look fancy but the Standard Poodle is anything but a “fou-fou” dog. 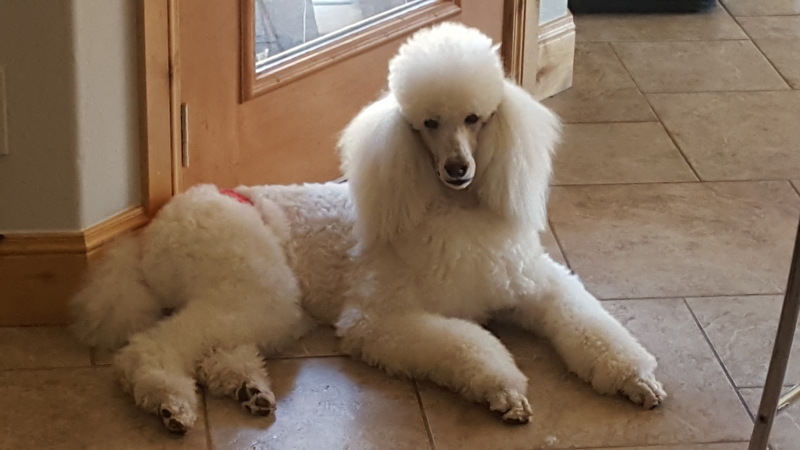 If you are looking for the perfect companion and are after a smart, loyal, non-shedding, and all around great dog then you are looking for a standard poodle!